Aaron Eagle had come to the library to see Dr. Hall. His expertise in prophecies was exactly what Aaron, and the remaining Chosen needed. Unfortunately, he found a Dr. Hall, but not the one he had wanted. Instead of the senior expert he had expected, he found a Dr. Rosamund Hall, a young woman, much too young to be the daughter she claimed to be. She was also easy to distract, which was proven when Aaron brought her to their headquarters. She inevitably became engrossed in her research. She was also ignorant of her beauty she kept hidden, naive of life in general, and impossibly innocent. She was almost the antithesis of himself. Rosamund knew she had been sheltered, but she didn't mind. She loved what she did, and could lose herself for hours in her work. She had no illusions of who she was, and she knew better than to trust someone like Aaron. He was so much more than her - more assured, more worldly, more sophisticated. She knew he only needed her to find the prophesy. She couldn't allow herself to fantasize that he might want more. For that would be all it would ever be - a fantasy. 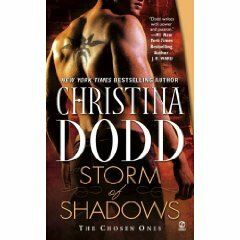 Storm of Shadows was a thrilling adventure from beginning to end. Aaron and Rosamund travel the world in search of the prophesy, and discover love along the way. Their path is fraught with danger, both from the Others, past enemies, and the prophesy itself. It was a bit difficult to conceive of a woman, living particularly in New York City and being as widely traveled as she was, but still be so naive and downright gullible as Rosamund was. Or that Aaron would be so drawn to her. Watching Aaron slowly reel her in, and how he simply adored her for who she was simply was endearing.